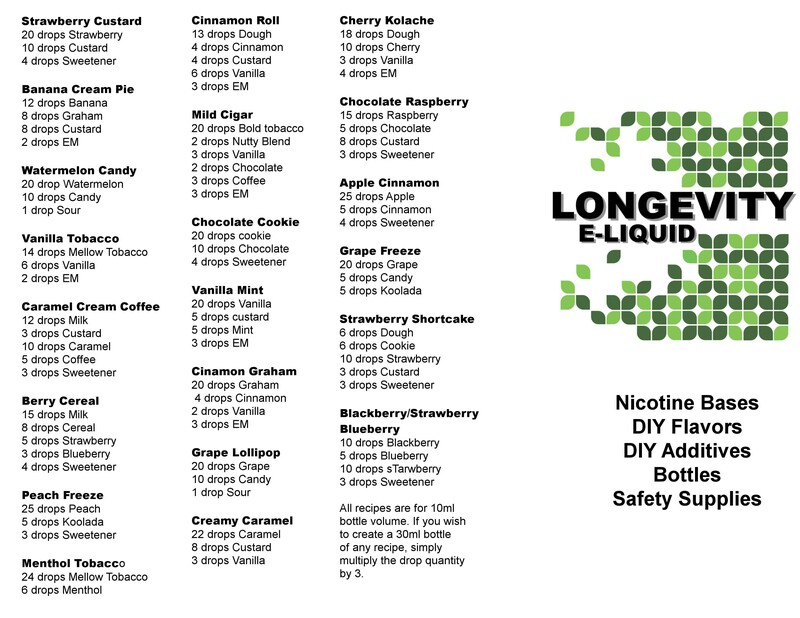 Making our own DIY eLiquids has long been an interest both in terms of creating unique flavors and helping save costs over premium eLiquids. 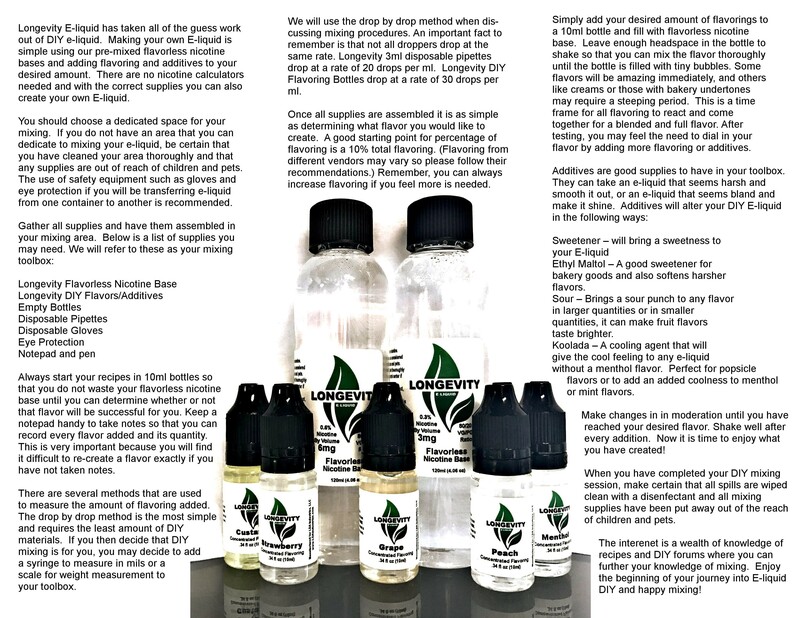 This do it yourself (DIY) approach has been a challenge for many due to the hazards of handling concentrated nicotine while also attempting to get the base mix of a good VG (vegetable glycerin)/PG (propylene glycol) to deliver the smoothness desired before any flavors are added. 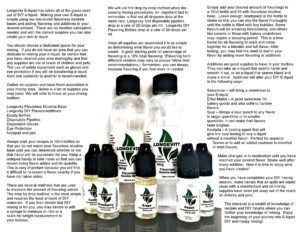 Simply having concentrated nicotine around the house has been enough to stop many who want to try their hands at making their own flavors. 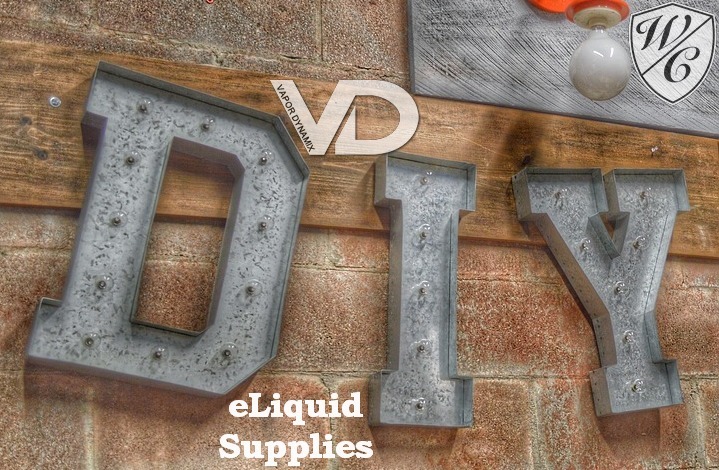 In partnership with Vapor Dynamix, Wood Creek Vapory is happy to offer their Longevity line of DIY eLiquid products. 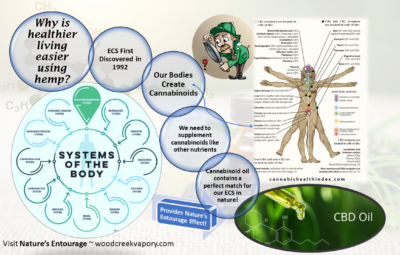 Promoting safety and quality first, Longevity starts with a satisfying, quality premixed base. There is no need to buy or handle dangerous levels of nicotine. 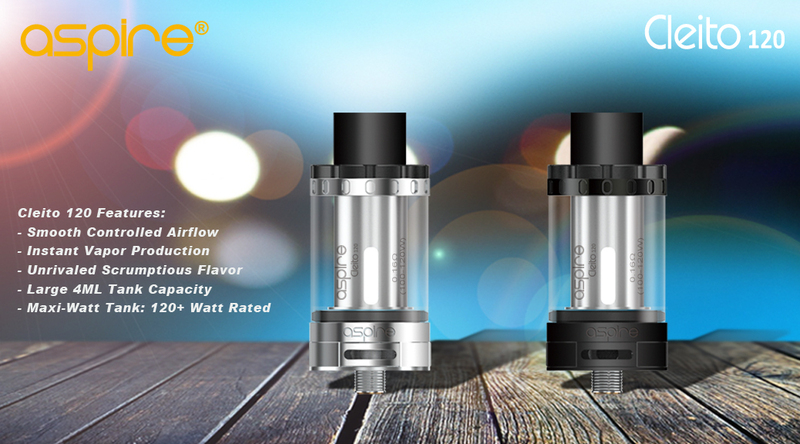 Instead, the base formula comes with 0, 3, or 6 mg of nicotine into an 80 VG / 20 PG mix to begin. Depending on the flavor recipe used your final mix will generally be in the 75/25 or 70/30 range once finished. 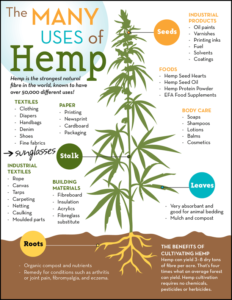 Some will want a higher nicotine level than .6% and we’ve thought of that as well. We offer safe nicotine pouches of a 10% and 20% concentration level from Sapphyre Nic for use in both DIY and premium lines to boost nicotine (see menu for pricing details). Sapphyre Nic has a very easy calculator, on their site, to help determine what strength and the number of pouches to boost the level when desired without the hazard of handling concentrated nicotine. 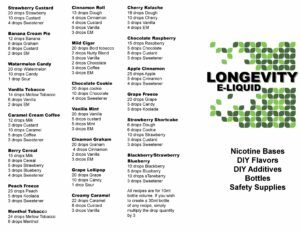 Carefully review the instructions below and see some beginning recipes designed to easily get you started on your path to creating interesting, all day vaping eLiquids safely.